We often see Stingers athletes working on the field, but how often do we see or hear about them working in the classroom? Or at their day-job? The life of a student athlete is a busy one, often punctuated by long days and tight schedules. 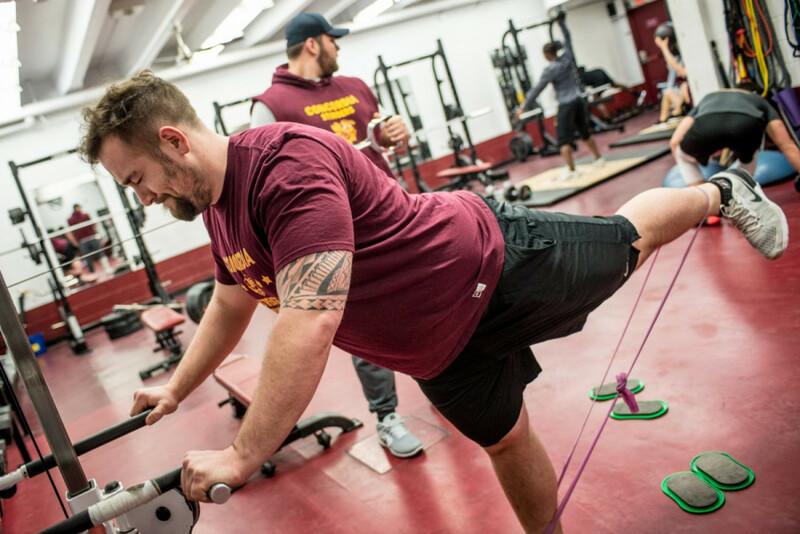 For Stingers offensive lineman Noah Domingue, this has been his way of living for the last three years. Domingue started out with the Stingers football team in 2016-2017 and has been juggling football and academics ever since. The six-foot-three business administration major says the off-season is much less stressful, and for obvious reasons. “During the in-season, we have to pick classes in the morning, because we have practice at night and meetings at 3 p.m., so that really puts us in a time crunch, because you have those classes that are only at a certain time,” said Domingue. However, the off-season is still no walk in the park. It’s a Thursday morning in mid-March and head coach Brad Collinson has given the team the weekend off, noticing fatigue setting in as the winter semester comes to a head. His players have been instructed not to work out or train, but not until after a mandatory 6 a.m. team run. Domingue was up bright and early, ready to hit the track—but not before showing some love to Snoopy, the enthusiastic goldendoodle puppy he got at the start of training camp. “[Having a puppy] has added a sense of responsibility to my life alongside academics and athletics,” he said. On a day without a morning run, Domingue’s day typically starts around 8 a.m. Get up, feed Snoopy and let him out, and then get on with the day. Without games and in-season practices, he’s free to schedule workouts that fit his schedule, and time outside of classes and workouts is used for studying or prepping meals for the week. While some of his teammates work part-time jobs during the school year to pay for academic and living expenses, Domingue works enough throughout the summer with a commercial moving company to afford to live without working during the school year. This may sound like the best-case scenario, but there’s still sacrifices to be made. Working full-time during the summer puts a strain on his training schedule with the team. Workouts are scheduled ahead of time and not flexible like during the winter. Having a job with no set schedule makes it difficult to predict when he may be available to train. After the team run, Domingue met with an academic advisor at Concordia’s downtown campus about potentially switching his major. Around 11:30 a.m., he finally headed home to cook breakfast and start on any school work left to be done, and review material he learned over the course of the week. Usually this takes him to about 4 p.m., and then it’s time to meal prep, and on any other Thursday he’d usually lift at 5 p.m. Sounds pretty relaxed, right? But during the fall semester when football season is in full swing, and with midterm season looming, things get more complicated. Practices run from 5 p.m. to 7 p.m., and then there’s only a few hours left in the day, then players have to eat and study. “You’ve got to make a choice, either make something quick and study or make something a bit bigger and lose a little bit of time studying,” he said. And then there’s sleep, you can’t forget about sleep–especially on nights before those 6:30 a.m. team runs. Time management is a major part of Domingue’s life, and the life of any student athlete. There’s lots that needs to get done, and only so many hours in a day. Schedules during the season need to be meticulously planned. Domingue keeps a Google calendar updated with all team workouts, classes and tutorials, study hall sessions, and practices during the season. Having such a packed schedule can sometimes lead to school getting in the way of football, and vice versa. 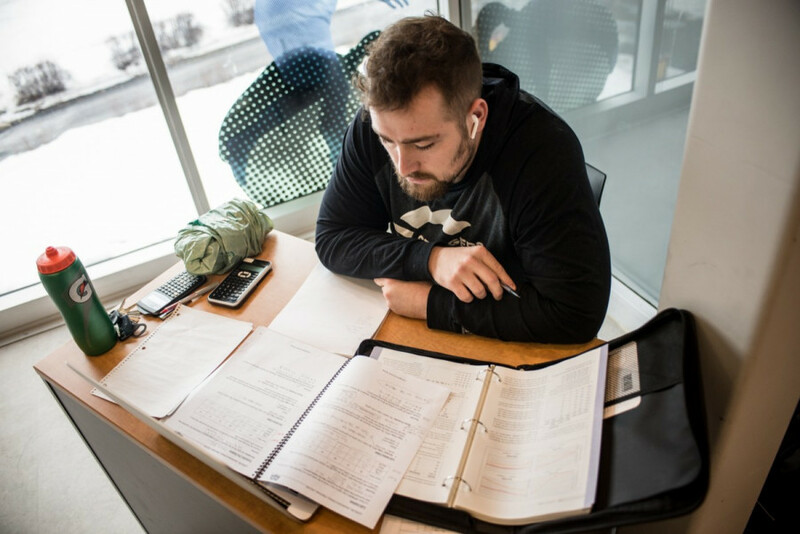 U Sports requires players take a minimum of 18 credits per academic year, and that they maintain a 2.0 GPA to remain eligible. Collinson wants his players to strive for more than just the bare minimum, requiring players to maintain a 2.5 GPA. Players who fail to do so must attend study hall sessions the following semester, ensuring they put extra time into their studies. For student-athletes who have trouble keeping up with their classes, the athletics department offers resources to keep them on track. 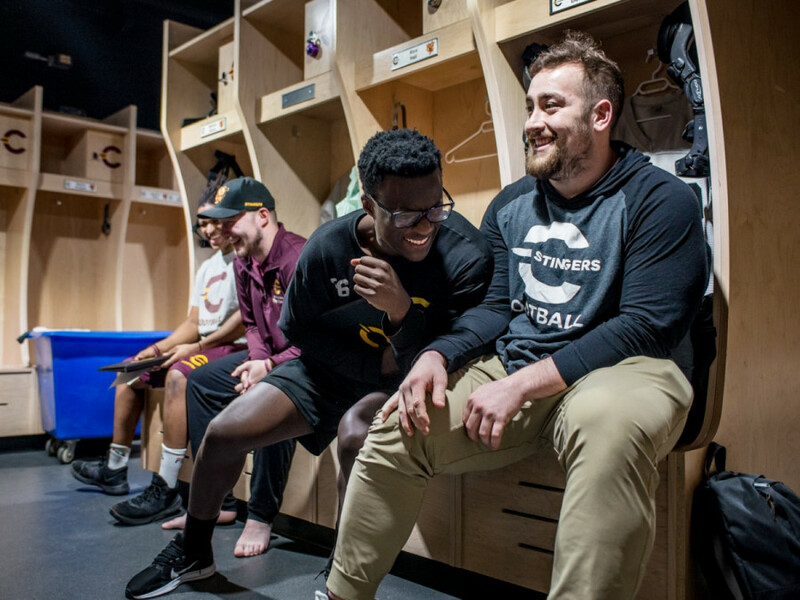 Most classes have tutorials, and it’s fairly easy to get Stingers varsity academic coordinator Craig Beemer to put a tutor on the department’s payroll if a player is willing to look for one, said Domingue. Regardless, being on the go all the time can be stressful and draining. Playing a sport like football, and in a position like Domingue’s, only adds to that. The reality of an offensive lineman is constantly putting your body on the line, and repeatedly going head-to-head with someone on a weekly, and sometimes daily, basis. With all the research that’s been done in the last few years on chronic traumatic encephalopathy, it’s hard not to be at least a little bit afraid of putting your brain on the line time and time again. CTE is a brain condition resulting from repeated hits to the head that cause problems with thinking and memory, personality changes, and behavioral changes including aggression and depression. For Domingue though, football allows him to help other athletes down the line. He’s been participating in concussion research at Concordia, allowing researchers to attach electrodes to the inside lining of his helmet in order to track brain activity after a hit. Domingue knows that CTE can only be definitely diagnosed after the person passes away, and football holds too special a place in his heart for him to quit over worries of what may happen in the future. He said that football has given him so much, and changed who he is as a person. With the way medicine is advancing, Domingue doesn’t think that parents should worry about putting their kids into football, or any sport, because the rewards can often outweigh the risks in the long run. For many student-athletes, the goal is less so to be a student and more to be an athlete. Plenty come through the football program and do the bare minimum to stay eligible because they know that they wouldn’t be at Concordia without football, said Domingue. That’s not him though. Growing up with a father who was a business owner, Domingue has dreams of opening his own business. “I’ve always, in my head, wanted to open up my own training facility for athletes,” he said. That doesn’t mean a professional career is off the table, though. Domingue is technically a fourth year player in terms of eligibility, after spending time at a military college in New Mexico prior to attending Concordia. The problem is, he never actually played for that team, spending the whole season on the bench. Domingue is in the process of proving to U Sports that he didn’t play, trying to obtain documentation from his former school to gain back that year of eligibility and go into next season as a fourth year player rather than a senior. If he does manage to get reclassified, he’ll be eligible to participate in Canadian Football League recruiting events such as the combine and the East-West Bowl, like teammates Maurice Simba and Matt Halbgewachs did last off-season. A professional playing career could even help him in his future business endeavours. If things don’t work out, it’s no skin off his back—Domingue is happy to move on and start his career in business after graduation. “[If I can’t get reclassified] then I still have one year of football left and then I still have a degree left to finish, and then after that I’ll figure out where life takes me, basically,” he laughed.